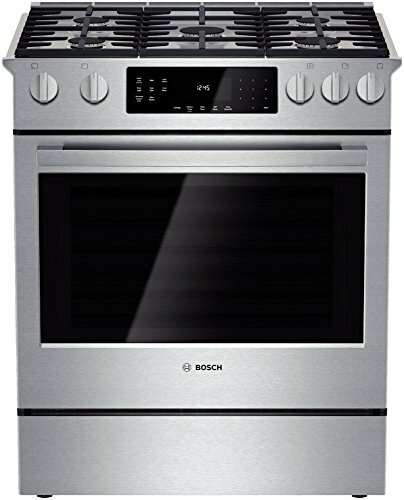 The Bosch HGI8054UC 800 30" Stainless Steel Gas Slide-In Sealed Five Burner Range offers a front mounted digital control panel and a convection oven. The burner array features three durable steel grates for a smooth cooktop, so large pots and pans can be slid rather than lifted across the cooktop. The Bosch 800 series range features a stainless steel finish and flat top. Rather than having to reach over hot burners to adjust timers and temperatures, your controls are at the front between the gas burner handles. The digital display allows you to dial in your temperature and includes the oven light icon to check the progress of your dinner. The burner controls across the front make it easy and safe to adjust the heat on anything you've got cooking. The digital oven display and controls make it simple to enter the temperature you need; no need to push the up or down arrow to set the oven temperature. On this display you'll also find an oven light icon to check on your baked goods; the light also turns on when you open the door as expected. This is a gas unit; professional installation is strongly encouraged. Not only will professional installers have the tools necessary to disconnect your old stove and install the new one, but they can handle the weight of this unit (nearly 250 pounds) and will haul off your old stove. The Bosch HGI8054UC 800 is well designed for installation in many applications. The back of the unit features cut outs for easy placement of gas lines and electrical cables. This Bosch slide in gas range is 30" wide but has a slight flare at the top to prevent the mess of dropping food down between the stove and cabinet. This stove offers a pyrolitic self-cleaning cycle; simply let the stove cool, sweep out the ash and you're done. The burners are sealed and easy to wipe down once you've moved the grid. The grid comes apart in three pieces to reduce weight and make it easy to get at the cooktop. You can purchase a center griddle to use instead of the center grid unit. In addition to the 4.6 cubic foot convection oven with multiple stainless steel baking racks, this stove features a warming drawer. There are five burners across the top and a three part grid that provides cooks with a flat cooktop. If you cook with cast iron or struggle occasionally with large stockpots, this cooktop will make life much easier! If you've been avoiding a convection oven because of concerns about noisy fans, this is the stove for you. The convection fan won't come on until the oven is fully preheated, and it's extremely quiet. Convection baking both simplifies and shortens the baking process, so be ready to adjust your favorite recipes and always keep an eye on things. Your usual temperature setting and baking times will change once you add hot air to the mix. Convection ovens can take some getting used to if you've never used one. They bake things more quickly and you may need to lower your baking temperatures on your favorite foods. The Bosch HGI8054UC 800 unit offers many different cooking modes, including convection and non-convection baking and roasting, proofing at low temperatures for your bread and pizza dough, and broiling. The flare top is ideal for anyone who really loves to cook and may make a mess. There's a small lip at the edge of the sides of the cooktop that keeps spills from sliding down between the stove and cabinet. Front-mounted controls mean you don't have to reach across a hot cooktop to turn off burners or your oven. The stainless steel finish is easy to match and to clean. In addition to the convection oven, you can enjoy the use of a warming drawer at the bottom.5) If you get the installation package, the installers can haul off your old unit. The oven trays slide in on grooves along the walls of the oven; over time, this can lead to scratches in the enamel. This unit is quite heavy. Expert installation is available; be prepared to discard all packaging on your own. The warming drawer opens at the push of a button but sometimes the button requires several pushes to get into the drawer. There are two large burners on the cooktop, both at the front. If you work with small saucepans, this may be a challenge. The Bosch HGI8054UC 800 is an ideal tool for home cooks who are ready to invest in a professional quality stove. The well designed grill plates offer an even cook top with plenty of placement options for pots of all sizes.